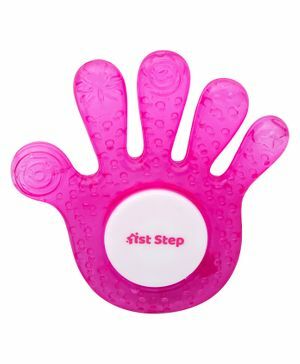 1st Step Baby Water Filled Teether is specially designed for use during baby's teething phase. It is easy to hold and can assist in baby's development of hand-eye coordination. It is BPA free. Easy to hold & carry. This teether comes in an attractive shape for baby's to have fun. Made up of high quality BPA free material? Specially designed shape facilitates the baby's grip? Cools and soothes baby's tender gums? Develops hand and eye co-ordination? Fun colours and easy to hold shapes? this is a good teether for kids. kids loves hand bits..
DONT BUY ANY PRODUCT OF FIRST CRY.. NOT SATISFIED WITH THIS.. VERY HARD. BABY CANT USE THIS.. VERY BAD QUALITY. PRICE IS TOO HIGH..
first cry all the product was very good and even service are v.nice iam fully satisfied. always suggest others buy from first cry. "It is little bit hard"
It is little bit hard and big for 4 months old baby.